I grew up in New England spending summer and fall working on our family farm. By cultivating the soil thru the growing seasons of tobacco and vegetables, I came to love the richness of the earth. Plants shapes and soil line forms created from wind and water erosion became an enduring part of my consciousness. It helped to have a botanist mother and agronomist father who often took us on walks to collect and identify plant species and rock formations. I feel that my vessel forms were influenced by these childhood experiences and are reflected in my use of texture. The glaze technique that I use reflects my love of the organic. Even today, finding a natural textured form, such as bark, which when pressed into clay, is pure excitement. 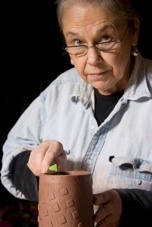 Other influences are the vessel forms and techniques by master potters Hans Coper, Mary Barringer and Sy Shames. the fundamental character of the medium. In a sense, I work with spaces___ areas created between texture and surface. Senior Graphic Designer, HarmonyCOM -2000 to 2001, Marketing Communications Department-United States, Ann Arbor, Mich.
Senior Graphic Designer, Print Services -1968 to 2000, Wayne RESA (Regional Educational Service Agency), Wayne, Mich.
Staff Artist -1965 to 1968, Audio Visual Education Center, University of Michigan, Ann Arbor, Mich.
Eastern Michigan University, College of Multidisciplinary Science, Ypsilanti, Mich.
Washtenaw Community College - Graphics, Ypsilanti, Mich.